Made to manage loads of over 10 tonnes without breaking a sweat, our 14mm stainless steel rope in this 18×7 configuration should suit various prospective uses. Let our team customise your order of 14mm 18×7 Stainless Steel Wire Rope with fittings to see just how versatile it can be. Corrosion can cause complications for some types of wire rope, but when stainless steel is used this is not a concern. It is made to stay unblemished even when water comes in constant contact with its surface. 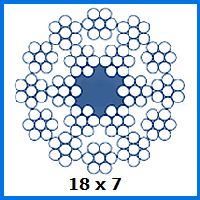 Maritime use of this 18×7 rope is common and it can also be found in many sewage treatment plants and other moist environments as a result. But what about the other properties of this 14mm rope? Well the 10,289kg capacity makes it sturdy enough for lifting duties, while the 100.9kN breaking force means that it will not snap or shear when hit by sudden pressures. Our expertise in all things wire rope-related means that we can take this 18×7 configuration rope and use it as the basis for a number of more complex creations. This includes bespoke assemblies, balustrades and a whole heap of other options to boot. As a result of our advanced equipment and techniques for manufacturing wire rope, Rope Services Direct will be able to fulfil almost any custom order. You can ask for help via email or by dialling 01384 78004 to speak with an RSD team member. Our assistance is given without obligation, although quotes are available if you need them. 14mm 18x7 Stainless Steel Wire Rope Overall rating: 5 out of 5 based on 6 reviews.